Emm, thinking about it now, I probably should have published this post before Christmas but it is another one that slipped though the net. 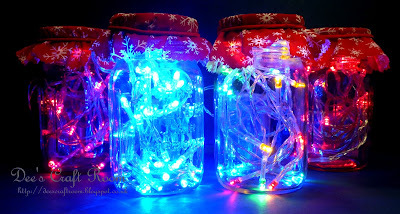 I couple of years ago I made a light jar and liked the effect so much I decided to make some more this year. This photograph really does not do them justice, they are far prettier than they look here, especially if you put the lights on a slow twinkle. In the autumn I like to do some pickling for my family and a while ago I purchased some second hand Kilner jars from ebay for this purpose. However, it was not a good purchase as I later discovered that they were only pennies more expensive new, and the lids of these jars were rusty and therefore unsuitable for food storage. 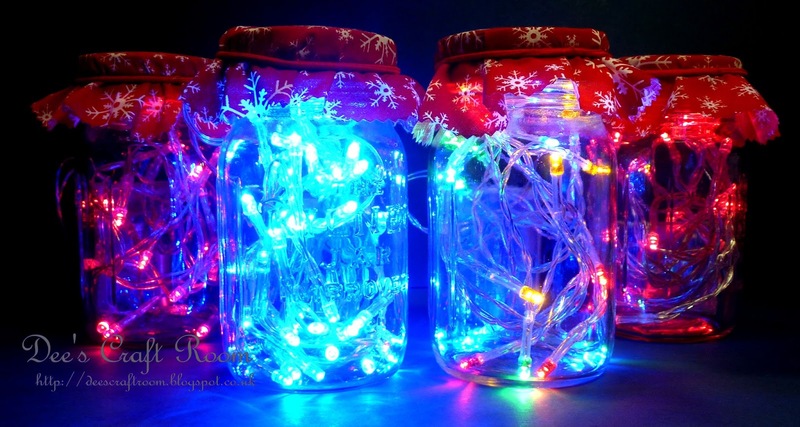 However, I did not want to waste the jars so I went on Pinterest to get some ideas of what else I might do with them. This project caught my eye and they are so simple to make. Back to ebay to buy battery operated macro lights and some suitable fabric. My initial idea was to hide the batteries in the lid, but the battery pack was too large for that. However, because of the design of the Kilner jar I was able to take the wire out through the top of the loose lid and the little fabric mop cap nicely hides everything. I used red hairbands to hold the mop hats in place. I think they would also look good outside on warm evenings ..... I would probably change the pattern on the fabric though! Thank you for visiting today and I hope you have a wonderful weekend. I've seen these on Pinterest too, and think they are so cute. I like your idea of fabric tops. They will look amazing in the summer evenings......or anytime. Thank you Krisha, they look great and are so easy to make, I would encourage you to have a go. I am so happy to be able to return the favour, as it were, and to provide you with some inspiration for a change. Your present sounds gorgeous by the way. Thay are so easy to make, do have a go. I gave these away as Christmas gifts, so the different colours went to different new homes. However, I can just imagine a garden with several tables and different coloured lights on each table. Wow, that is an amazing prize, they cost me a fraction of this. Wonderful idea and so pretty too. .... and really easy to make Faith.